Mourners at a mosque in California said goodbye Saturday to a 2-year-old boy whose Yemeni mother successfully fought the Trump administration's travel ban to hold the boy before he died in the United States. 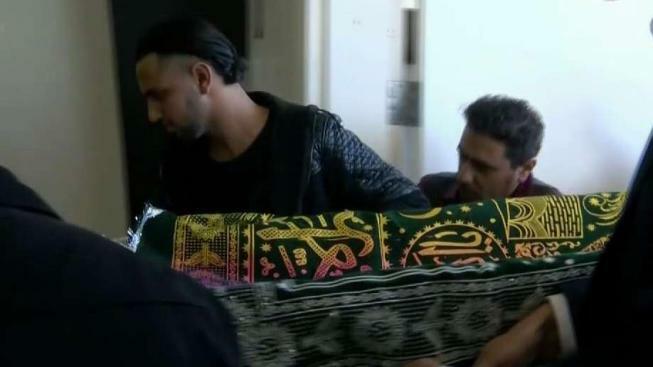 The father of a 2-year-old boy who was separated from his Yemeni mother until she successfully fought the Trump administration's travel ban to see him in the United States laid his body to rest Saturday, a day after the child was taken off life support at a hospital. Under a cloudless winter day, Ali Hassan carried his son's small body to bury at an Islamic cemetery in California's Central Valley. "I'm a U.S. citizen; my son is a U.S. citizen," the 22-year-old father told mourners at a service before burial. "The Muslim ban kept my wife from coming to the U.S. for over a year. It forced me to choose between my son's health and keeping our family together. We are angry, but we know our son did not die in vain." The child's distraught mother mourned privately at home. Abdullah Hassan died Friday at UCSF Benioff Children's Hospital in Oakland, where his father brought him in the fall to get treatment for a degenerative brain condition. He had been on life support when his 21-year-old mother, Shaima Swileh, arrived last week. Hassan spent his youth in California's central valley after his family immigrated there from Yemen. During a trip to the warn-torn country in 2016, he fell in love with Swileh and married her that same year. Because she is Yemeni, Swileh was restricted from traveling to the United States under the White House travel ban that's keeping citizens from Yemen and four other mostly Muslim countries from entering the country. When Abdullah's health worsened, Hassan went ahead to California in October to get their son help. As the couple fought for a waiver, doctors put Abdullah on life support. Hassan said he hopes his family's struggle will lead to policy changes and families like his will not have to separate.